A man cuts the throat of a tethered sheep whilst another holds it leg, with other men looking on beyond. A large hammer lies discarded in the foreground after being used to knock in the tethering peg. Castrated sheep and goats were frequently used in sacrifice in place of oxen, with particular care taken to note the way the beast falls, since this may indicate the success or potential failure of the sacrificial purpose. Evans-Pritchard describes having witnessed a Lou sheep sacrifice at Yakwach for a girl possessed by a lion-spirit, a cow also being dedicated to the spirit to placate it. Note on print reverse ms pencil - "NUER RELIGION Plate X Clarendon Press/ Evans-Pritchard" [typewritten on label] "Please return, after use, to The Curator, Pitt Rivers Museum, Parks Road, Oxford." [Ms ink] "Spare copy Alb I no.42"
Morton, Chris. 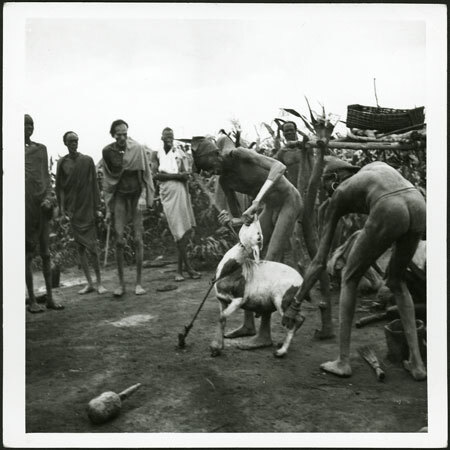 "Nuer sheep sacrifice" Southern Sudan Project (in development). 03 Jan. 2006. Pitt Rivers Museum. <http://southernsudan.prm.ox.ac.uk/details/1998.355.21.3/>.